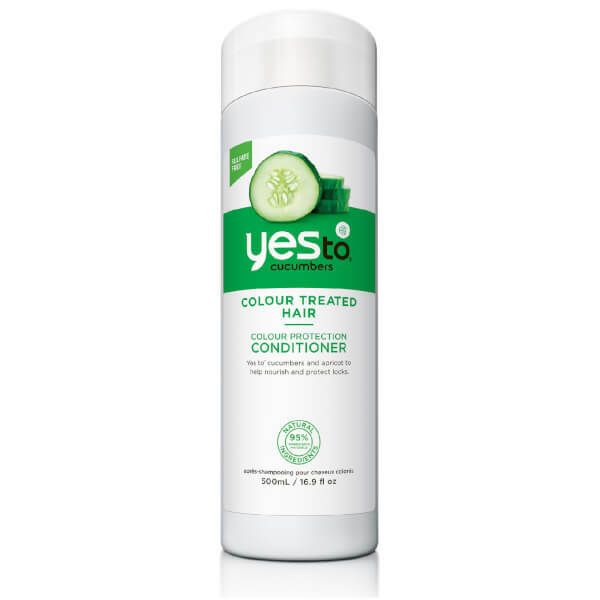 The Yes To Cucumbers Colour Protect Conditioner is a natural, sulfate-free treatment that works to prolong hair colour, prevent fade and enhance shine. Fortified with a vitamin-rich blend of Cucumber, Apricot and Aloe, it smoothes and strengthens each strand while antioxidants help shield from environmental aggressors that can lead to dullness. Expect vibrant, revitalised locks with a healthy-looking gloss. After shampooing, massage a generous amount into hair and rinse. Water (Aqua), Cetearyl Alcohol, Behentrimonium Chloride, Passiflora Edulis Seed Oil, Cucumis Sativus (Cucumber) Fruit Extract*, Camellia Sinensis Leaf Extract, Aloe Barbadensis Leaf Juice, Spinacia Oleracea (Spinach) Leaf Extract, Prunus Armeniaca (Apricot) Fruit Extract, Guar Hydroxypropyltrimonium Chloride, Glycerin, Fragrance (Parfum), Cetyl Esters, Glycoproteins. *Certified Organic Ingredient.